At retail, beautiful plants are just part of the equation. Research shows that 9 out of 10 customers say they want a premium brand they can trust. Growing plants in branded pots and packaging helps the retailer create a consistent and eye-catching display which not only helps build the consumers' confidence, but also encourages them to return time after time to repeat the success they had in their garden. That’s why Ball Colegrave supports all its top performing varieties with high impact colour labels and offers a package of branded point of sale for major retail programmes such as Petunia Wave™ and Trailing Pansy Cool Wave™. The Wave® brand of trailing & spreading Pansy and Petunia is supported by a powerful marketing programme to create a remarkable and obvious presence in your Garden Centre. Trixi® Pots, Labels, and Posters are available to support your retail promotion. Click here to find out more on how to order. Help your pull-though sales by flagging up to customers their favourite varieties are in stock with our colourful posters and banners. There is no better way than to show lots of pictures, particularly of New and exciting varieties so customers can see their garden potential. We offer a New Varieties CD packed with some great images of New Varieties to help you with your own internal marketing. Looking for some colour inspiration? Look no further! ‘Trends’ is a brand new ideas book, packed with fashionable colour combinations to make the whole garden decorating experience simple, fun and magical! ‘Trends’ is based on a wonderful experience we had this Summer in our Trial Grounds with trade visitors and home gardeners. Nine stimulating and exciting colour coordinated patio gardens were created. Each incorporated trusted plant favourites, new innovative varieties and the latest containers from leading pot retail manufacturers. Everyone loved it, especially the home gardeners! Our visitor survey also indicated over 95% of these visitors agreed/strongly agreed “colour themed gardens are very useful for planning future plant purchases, were helpful and inspiring, and would like to see more colour theme ideas in the future”. Clearly colour is ‘King’ when it comes to decorating in the garden, so make sure you talk to your staff and bedding plant supplier about how you can work together to maximise your colour sales. 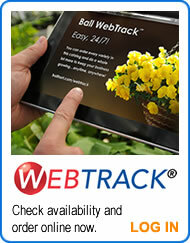 Click here to view ‘Trends’ Garden Decorators Guide. If you are involved in garden design and landscape or merely looking for some great flower bed ideas, why not take a look at our Parks Tool Kit (2008), full combination ideas, plant spacing and positioning information. All Ball Colegrave plant varieties are supported with colour labels to promote the product all the way to the consumer. All Ball Colegrave Varieities are offered to your grower with high impact colour labels to ensure your retail bench has a professional and consistent presentation. Our own 10cm (4") Ball label is supplied with over 950 varieties of bedding and patio plants as well as 120 popular vegetable varieties. The full range of our lasting beauty perennial (Over 380 varieties) are supplied with the distinctive 15cm (6") Blue label for a strong retail presentation. Consumers can have quick & easy access to vital additional plant information, inspiring trends, collections and themes instantly by scanning the QR code on the label's reverse. And if you simply want to make sure you have a cost effective label to cover all your plant needs, no matter what pack or pot you're selling in.... MasterTag® have it covered. MasterTag® offers over 2,200 bedding and pot plant varieties and 400 vegetable varieties, covering all the seed and seed-raised plug varieties in the Ball Colegrave catalogues.